Chalet vast and independent on semi raised ground of more than 2000 m ², clear, not entirely closed, in a peaceful, nature, beautiful exposure. Label Clévacances n ° 391324.- Classified 3 keys. Living area 100 sqm plus balcony terrace, accommodating up to 6 people, nicely furnished and decorated. - Large living room with fireplace, central living room, flat screen TV, Hi-fi, nice dining area, baby high chair. Single storey garage that can accommodate cars and bicycles: washing machine and electric hot water balloon, drying rack, garden furniture, barbecue, second refrigerator, freezer, sun loungers, parasols and various equipment available including 1 man's bike and a bike. Located near the village, you will live in the heart of nature in a rare quiet, close to the forest, breathing the incredibly pure air filtered by the countless fir trees and spruces of the area and enjoying an exceptional view. The activity of the village is centered on raising Montbeliarde cows whose milk is used in the development of the famous Comté cheese. Its fruit multi-medalist craft that produces bio, opposite the town hall you will provide favorable rates and other premium products; milk, cream, butter, cottage cheese, Morbier. You will be the starting point for wonderful walks in the forest of Saint Maurice and the surrounding forests. Small guides available in the chalet will make you browse short hiking trails to the discovery of a similar nature. Fifteen lakes within 20 km rejoice your stay, some with beaches for swimming (Clairvaux, Chalain, Etival, Vouglans) and fishermen will also skillfully out attractive and various rivers the Fario trout. You can practice on Lake which authorize watersports and there even rent boats. And why not board the Louisiana cruise on Lake Vouglans (82 km circumference)! Places of interest will welcome you :: Pasteur house, Salines de Salins-les-Bains and Arc et Senans dam Vouglans multiple industrial or artisanal cheese cheese -The Laughing Cow. You can discover by visiting their workshops activity Crafts: pottery, wood turning factories or horn, leather crafts. You will get to know producers Viticulteurs-: Vin d'Arbois Vin Jaune, Straw Wine, Macvin that will make you always enjoy in moderation and often discover wonderful and incomparable wines from the typical Jura grape varieties. You will have access to nearby equestrian centers, tree climbing adventure in the forest, and you will not miss an overview of the region in microlight . Located near the village, you will live in the heart of nature in a rare quiet, close to the forest, breathing the incredibly pure air filtered by the countless fir trees and spruces of the surroundings. The activity of the village is centered on livestock in the countryside of Montbeliarde cows whose milk is used for the development of the famous Comté cheese. Its fruit multi-medalist craft that produces bio, opposite the town hall you will provide favorable rates and other premium products; milk, cream, butter, cottage cheese, Morbier. Fifteen lakes within a 20 km radius delight your stay, some for swimming (Clairvaux, Chalain Etival, Vouglans) and fishermen will also skillfully out attractive and the various rivers brown trout. You can practice on Lake which authorize watersports and there even rent boats. And why not board the Louisiana cruise on Lake Vouglans (82 km circumference)! Guests have access to nearby equestrian centers in tree climbing adventure in the forest ', and you will not miss a flight over the area in a microlight. Not bad if you don't need the internet. Excellent welcome from the very helpful manager, Nathalie Pelletier. She doesn't speak much English but we were able to converse in French. Very conveniently situated for many of the major attractions in the French Jura. Our highlights included the Herrisson Falls and the Hidden Valleys of Baume les Messiurs. We also had a day trip to CERN ( an hour and a half away) and then on to Lake Geneva. Turning back to the chalet you may have to spend a lot in electricity to heat i,t and the 2 single beds are soft and uncomfortable, at least for adults. The first bedroom has a standard size double which is much more comfortable. The lounge/dining room is rather gloomy, on the other hand the property is very well equipped, including the kitchen. However we iniitally we got caught out by the hobtop as the power markings are worn out. Full power is next to the off position. One of the things that attracted us was it had a small bath tub which is very hard to find. We wish more properties had a bath as it's lovely to soak after a long day walking. Note however that the shower attachment fixture is so low down you would have to sit down in the bath for a shower or hand hold it the attachment. The biggest problem for us personally was that whilst the advert on HomeAway said it had internet access this is only via mobile phone signal. This was intermittent and when available was very slow. We were able to pick up e-mails but made searching for tourist sites very difficult. However the phone signal on 02 was excellent. We checked this with owners after we booked but before we travelled and to their credit then gave us free bed linen and towels. Accueil excellent de la mandataire très serviable, Nathalie Pelletier. Elle ne parle pas beaucoup d'anglais mais nous avons pu nous entretenir en français. Très bien placé pour bien profiter commodément des sites majeurs du Jura français. Nous avons hautement apprécié les Cascades du Herisson et la reculée de Baume les Messieurs. Nous avons aussi fait une excursion au CERN, trajet une heure et demie en auto, suivie d’une excursion en bateau sur le Lac Genève. De retour au chalet, nous avons mis à fond le chauffage électrique pour le chauffer (sans allumer la cheminée). Les 2 lits une place sont un peu trop moelleux à notre goût au moins pour des adultes. Les chambres à coucher ayant un grand lit de 140 nous ont paru plus confortables. Le salon/salle à manger est plutôt sombre. La propriété est très bien équipée, y compris la cuisine. Cependant nous avons été pris de court, au début, par la table de cuisson dont les indications de puissance avaient été effacées( par les nettoyages énergiques des prédécesseurs). La pleine puissance est voisine de la position arrêt. Une des choses que nous avons aimées était la baignoire, de taille standard, regrettant qu’il n’y ait pas plus de propriétés qui aient de très grandes baignoires car c'est un plaisir de s’y immerger après une longue journée de marche. La position de la douchette est fixe en hauteur, il faut la prendre à la main pour se doucher comme on veut, ou s’asseoir dans la baignoire. L'annonce sur HomeAway, partiellement traduite du français, mentionnait « accès Internet » sans préciser qu’il fallait être muni d’une box de poche utilisant sa propre ligne téléphonique. Le signal était intermittent et très lent. Nous avons pu échanger des e-mails, mais la recherche de sites touristiques était très difficile. Cependant le signal de téléphone sur 02 était excellent. Nous en avons discuté avec les propriétaires, qui ignoraient cela, après réservation et avant notre départ. - En 2017 l'accès à Internet a été installé. - La table de cuisson rendue peu pratique a laissé place à une nouvelle plaque en vitrocéramique cette fois. A lovely chalet with wonderful views. The chalet is at one end of the village but it is not too remote. There are a variety of walks from the chalet although we were rather bothered by horseflies while walking. Locals advised this was because of the heat and threat of storms. Most of the day we could hear cow bells which was lovely. There are good sunsets from the balcony. It was about a ten minute drive to the nearest shops at Claivaux. Traduction :Un charmant chalet avec une merveilleuse vue. Le chalet est à l’extrémité du village mais pas trop éloigné. Il y a une grande variété de promenades à partir du chalet bien que nous ayons été plutôt dérangés par des taons en marchant. Les gens du pays ont dit que c'était à cause de la chaleur et du temps orageux. Très souvent dans la journée, nous pouvions entendre le son charmant des cloches des vaches. Il y a de beaux couchers du soleil visibles du balcon. Il faut compter à peu près 10 minutes de voiture pour aller dans les magasins les plus proches à Clairvaux. My husband and I had a most enjoyable stay at the chalet in Saint Maurice. We especially enjoyed sitting on the balcony, listening to the cowbells, and looking at the woods and pastures.The chalet is in a beautiful, pastoral setting, high in the mountains. We loved to walk into the village and buy the wonderful cheese, Comte, made there at the fruitiere. The chalet was exactly as described and the owners could not have been nicer and were very responsive to our needs. The property was clean and well maintained. We enjoyed driving to a nearby larger village, Clairvaux, for groceries and the market as well as enjoying the restaurants there. The Jura wines are delicious. We had a great time and recommend the chalet unreservedly. Mon mari et moi avons passé un séjour extrêmement agréable dans ce chalet de Saint Maurice. Nous avons particulièrement aimé être assis sur le balcon, écoutant les cloches des vaches et regardant les bois et les pâturages. Le chalet est superbement situé, à flanc de colline, dominant les près. Nous avons aimé nous promener dans le village et acheter le merveilleux fromage de Comte, élaboré dans sa fruitière. Le chalet a été exactement tel que décrit et les propriétaires ne pourraient pas avoir été plus agréables et ont été très réactifs à nos besoins. La propriété était propre et bien entretenue. Nous avons aimé aller à Clairvaux, une bourgade voisine, pour y faire notre marché et nos emplettes, et aussi profiter des restaurants qui s’y trouvent. Les vins du Jura sont délicieux. Nous avons passé un excellent séjour et recommandons sans réserve ce chalet. Ich habe die 1. Septemberwoche in dem Haus Urlaub gemacht und mich sehr wohl gefühlt. Auch meine Hunde haben den Aufenthalt genossen. Das Haus ist groß, man hat jeden Abend einen fantastischen Sonnenuntergang vom Balkon aus, morgens kann man mit der Morgensonne im großen Garten frühstücken. Es gehen direkt vom Haus weg schöne Wanderwege. Das kleine Dorf ist sehr angenehm. Die Verwalterin des Hauses ist sehr nett und hilfsbereit. Trad : J'ai passé la première semaine de septembre dans ce chalet et je me suis senti très à l'aise. Mes chiens ont également apprécié le séjour. Le chalet est grand, vous avez chaque soir un magnifique coucher de soleil depuis le balcon. Le matin, vous pouvez prendre votre petit déjeuner avec le soleil du matin dans le grand jardin. On va directement depuis la maison emprunter de beaux sentiers pour de longues balades. Le petit village est très agréable. La gérante de la maison est très gentille et serviable. Superbe chalet typique du Jura, très très bien équipé, tout confort. Animaux acceptés gratuitement, ce qui devient rare. Accueil pro et très sympathique. Idéalement situé dans un charmant village, calme absolu bercé par le doux tintinnabulement des cloches de magnifiques Montbéliardes avoisinantes. Multiples sentiers de randonnée à proximité, nombreuses activités à quelques kilomètres (baignade dans les lacs, accrobranche, vtt, ...). Nous avons passé un agréable séjour. Très bon accueil de Nathalie. Belle vue dégagée, pas de vis à vis autour de la propriété. Le grand jardin bien ombragé a permis de se protéger des grosses chaleurs du milieu d'été. Beaucoup de très beaux sites aux environs. 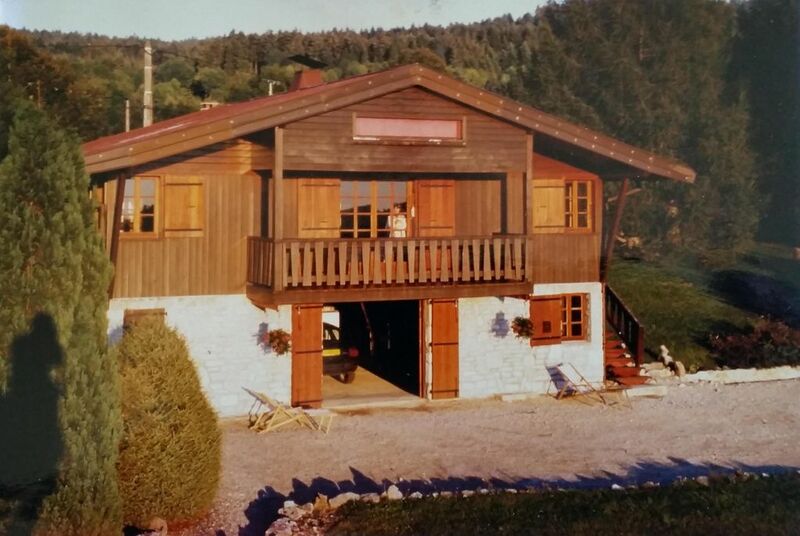 Detached chalet in a peaceful setting, ubiquitous nature, beautiful exposure, balcony / terrace, breathtaking views, partially planted garden, approximately 2.000 m² partly enclosed ..
Saint Maurice is a small village (about 200 inhabitants), pleasant and quiet for holidaymakers. Shops at 6 km. Privileged place for lovers of forest walk. Fifteen lakes within 20km. Trout rivers, waterfalls, caves, gastronomy (County - Yellow Wine), swimming, horseback riding, adventure forest, ULM; many sites and attractions to visit including Salines. garden furniture, sun loungers, parasols, barbecue, bike, mountain bike, miscellaneous. Upstairs: Large living room with fireplace, central living room with flat screen TV, HI-FI, Internet WiFi, comfortable dining area. Kitchen: dishwasher, hood, oven, refrigerator, 4 burner electric hob.